WASHINGTON – Total shipments of plastics machinery by North American suppliers posted another strong performance in the third quarter of 2015 according to statistics compiled and reported by SPI: the Plastics Industry Trade Association’s Committee on Equipment Statistics (CES). “The trend in the CES shipments data flattened out in the middle of 2015, but at a high level. Activity levels in the U.S. manufacturing sector slowed in the third quarter, and plastics machinery suppliers felt the effects. 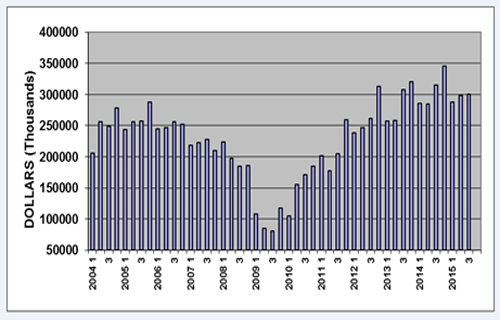 But the plastics industry continues to expand faster than many other industrial segments. In 2016, the real GDP (gross domestic product) in the U.S. will continue to grow at a pace that is at least in the range of 2.0-2.5 percent. 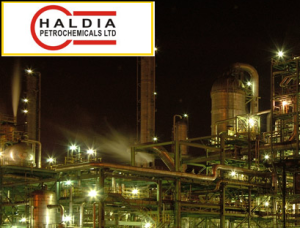 And demand for plastics machinery will remain solid due to the positive effects of steadily rising aggregate demand,” according to Bill Wood, the economic analyst who reports on the plastics machinery markets for the CES. Shipments of primary plastics equipment (injection molding, single-screw extrusion, twin-screw extrusion, and blow molding equipment) for reporting companies totaled $300.6 million in Q3. This was a small gain of 0.8 percent from the total of $298.4 million in Q2 of 2015, but it was a drop of 4.6 percent when compared with the same quarter last year. For the year-to-date, the total value of shipments is almost exactly the same as it was during the comparable period last year. A breakout of the CES data show that the shipments value of injection molding machinery declined 2.4 percent in Q3 when compared with last year. The shipments value of single-screw extruders advanced 3.3 percent from last year. The value of shipments of twin-screw extruders (including both co-rotating and counter-rotating machines) dropped 37.6 percent in Q3. 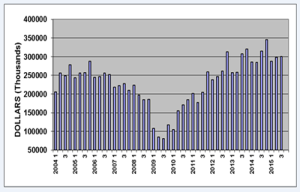 The quarterly estimated shipments value of blow molding machines dropped 9.0 percent. The CES also compiles data on the auxiliary equipment segment (robotics, temperature control, materials handling, etc.) of the plastics machinery industry. New bookings of auxiliary equipment for reporting companies totaled $118.8 million dollars in Q3. This was a jump of 9.8 percent when compared with the total from Q3 of last year. The Q3 decrease in the CES data on plastics machinery shipments was a weaker performance than the year-over-year increase of 2.2 percent (seasonally-adjusted, annualized rate) in total business investment in industrial equipment (plastics machinery is a subset of this category) compiled and reported by the Bureau of Economic Analysis as part of their quarterly GDP data release. The Q3 decline in the CES data were also weaker than the other major industrial machinery market indicator, compiled and reported monthly by the Census Bureau, which showed that the total value of shipments of industrial machinery eked out a gain of 0.3 percent in Q3 when compared with the year before (plastics machinery are also a subset of this category). “The manufacturing sector hit a plateau in the third quarter, but this should be considered a period of consolidation rather than a harbinger of an impending economic recession. The plastics industry posted an increase in output, but the growth rate decelerated. This plateau notwithstanding, the recovery in the US economy is still intact, and the plastics industry will continue to be a growth leader in the U.S. manufacturing sector. Household incomes are rising, residential construction activity is accelerating, and economic growth of 2.5 percent is expected for the coming year. For the plastics industry, stronger consumer spending in the coming months will offset the drag on some manufacturers caused by cheaper oil and a stronger dollar,” said Wood. The CES also conducts a quarterly survey of plastics machinery suppliers that asks about present market conditions and expectations for the future. The responses from the Q3 survey indicate that machinery suppliers remain optimistic about the market demand for their products in the coming months. 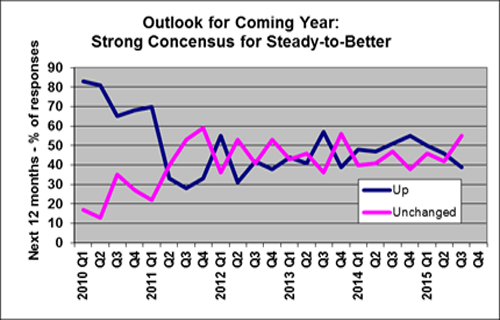 In the coming quarter, 89 percent of the respondents expect conditions to either improve or hold steady. 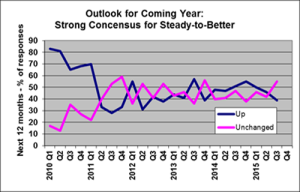 For the coming year, 94 percent expect conditions to be steady or better. Quoting activity in Q3 was steady or higher for 84 percent of the survey participants. Mexico is the only global region where a majority expects market conditions for machinery suppliers to improve in the coming year. Expectations for North America and Latin America are for steady-to-better market conditions. The outlook for Europe and Asia is steady-to-weaker. When asked about their expectations for the major end-markets for plastics products, a majority of the respondents indicated that the medical sector will improve in the next 12 months and the automotive sector will be steady-to-better. A solid majority expects that all other major end-markets will experience steady market conditions in the coming year.